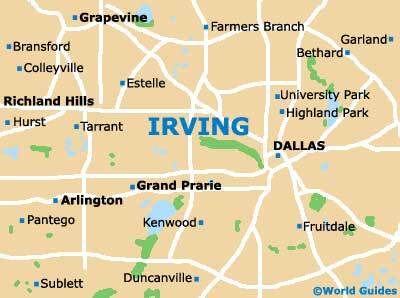 The charming city of Irving is located in Texas, between the popular destinations of Dallas and Fort Worth. This has long been a popular holiday spot with visitors to Texas who prefer the friendly atmosphere of Irving to the bright lights of Dallas, and this destination also features a number of natural beauty spots, such as lakes and parks. There has recently been a high level of development in Irving, meaning that there are a large number of modern houses and apartments to choose from, as well as older offerings. Some of the most popular neighborhoods in Irving include Hackberry Creek, HOA, and Valley Ranch, while there is plenty of affordable property to be found near the Dallas Love Field Airport, in neighborhoods such as Bluffview and Greenway Park. Apartments for rent are available in the center of the city and near to the main natural beauty spots, such as Mountain Creek Lake. There is a good selection of serviced apartments in Irving, ranging from stylish studio apartments to spacious two-bedroom apartments. Costing about double the price of the average standard apartment, these pads are ideal for those who put style and comfort first. Fully furnished and featuring all the latest modern conveniences, these apartments are the ideal home away from home. Foreign buyers will find that the property market in the US is open to them and that the process is the same as that for US citizens. Those purchasing property should allow three to five percent, in addition to the actual cost of the apartment or house, which will cover all fees. These extra fees include inspection fees, stamp duty and title insurance, and although they are non-refundable, they will ensure the sale goes through smoothly. While there are certainly plenty of qualified and experienced real estate agents to choose from in Irving, services tend to vary and taking the time to ensure that you have an agent who put your needs ahead of their own is essential. A good way to find a reliable estate agent is to browse the Internet for reviews from customers, check portfolios and seek an estate agent with a quality website. Located in the heart of Irving, RE / MAX DFW Associates specialize in property for purchase and rent within Irving and the surrounding area. Truzzie Howard Real Estate Inc.
With nearly 30 years of expertise in real estate in and around Irving, Truzzie Howard Real Estate Inc. offers a personal and professional touch to finding property. One of the city's largest real estate agents, Coldwell Banker Residential Brokerage features an extensive range of property to rent and purchase.